After the two movie boxsets I got last month I now have 249 movies I haven't watched in my DVD Collection. I think that is starting to get a little out of hand. And my Unwatched DVD shelf is overflowing. So I thought I better get on them this weekend. For the most part I have never seen these movies before. Though some of them I may have seen before. Just not since getting it on DVD. I am listing the movies below.. if there is a title below that you have seen and think I will like feel free to recommend it. If there is a title you are curios about and would like to request a review feel free to do so. While I can't promise I will do my best to fight it in at some point over the weekend. If there is a title you are curios about and would like to request a review feel free to do so. possibly... if I can get myself geared up for a long movie! I can't believe, that you did not watch this so far! Full Metal Jacket would have also been my choice, if I didn't have to return the request for "Gone with the Wind"
I think I will save that for when Britt and I do our "Face Our Fear" marathon next weekend! Pete this movie isn't scary even with your spider fear (just check my review it's a fun little film actually). I pretty much figured as much... but where I have so little movies anything to do with spiders I will need it for next weekend. Or I will run short on stuff to watch. A superb ensemble cast falls in for action in Stanley Kubrick's brilliant saga about the Vietnam War and the dehumanizing process that turns people into trained killers. Joker (Matthew modine), Animal Mother (Adam Baldwin), Gomer (Vincent D'Onofrio), Eightball (Dorian Harewood), Cowboy (Arliss Howard) and more - all are plunged into a boot-camp hell pitbulled by a leatherlung D.I. (Lee Ermey) who views the would-be devil dogs as grunts, maggots or something less. The action is savage, the story unsparing, the dialogue spiked with scathing humor. 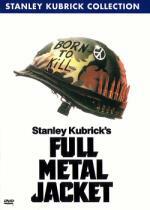 'Full Metal Jacket', from its rigors of basic training to its nightmare of combat in Hue City, scores a cinematic direct hit. Between the 2 sites this movie got more requests then any other movie. I was originally thinking I would save my war movies for the 4th of July weekend... and do a War Movie Marathon then... but with so many requests for this one I decided not to wait. This is a movie that I got from my mother's collection after she passed away. I am sure it was not a problem for her (especially with her eyes)... but first thing I notice about this movie is that it is in Pan & Scan. So my initial start-out is of disappointment.... this movie came out in '87... surely this isn't it's OAR!?! Then the next thing I knew I was starting to get into the movie. In no time at all I was hooked and glued to my seat. This is really is a great war movie. Granted this is coming from someone that seldomly ever watches war movies. But I know I enjoyed every second of it. I really liked how this movie started with the new recruits in basic training. Then followed them from there. And the scenes during basic training was surprisingly good. Especially the storyline around the character they called Gomer Pyle. Once they got out of basic training I felt the movie went town just a hair. But still remained an awesome movie. This is one I definitely would recommend... even if you are like me and war movies is not generally your thing. Give it a chance... I am sure you wouldn't be sorry! If I had to pick anything to complain about here it is not the movie... but this DVD release. As I already said... the whole Pan & Scan thing is disappointing. Then there is no worth-while extras. I mean I am glad we got the trailer for this movie on the disc. But there could have been... and should have been much more. I like the first half of this movie, but the second half is deceiving compare to it. Not that I don't like this movie who is certainly my favourite Stanley Kubrick's film.